I am fortunate to have a group of wonderful students working with me on a variety of topics. This website is an overview (and brag sheet!) for many of their projects. Zachery Laycock (WWU): Studying the optical and NUV variability of EK Dra with a 35 year light curve. Co-author on paper “The GALEX View of Boyajian’s Star”. Matthew Scoggins (WWU): Searching for variations in flare rates in Kepler stars. Jamel Adilia (UW): Searching for rotation periods from eclipsing binaries in OGLE. Riley Clarke (WWU): Flare rates from wide binary stars in the Kepler field. Outstanding Poster Award, WWU 2017 Scholars Week. Zachery Laycock (WWU): Searching for stellar activity variations in Mt Wilson stars with GALEX. 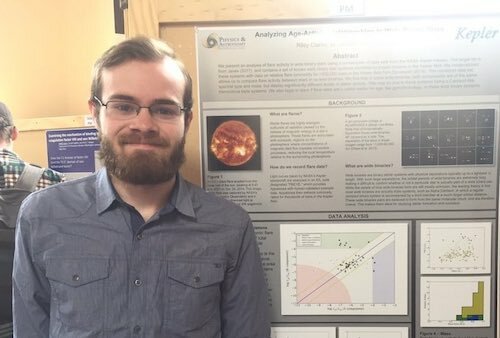 Austin Boeck (WWU): Searching for connection between flares, starspots, and photometric flicker with Kepler. Jonathan Cornet (WWU): Comparing flare rates between stars in Kepler. Riley Clarke (WWU): Flare rates from wide binary stars in the Kepler field.